The MR-350PS4 uses a proprietary pin-out on the PS2, which cannot be connected directly to any laptop or PC without the use of a cable set (USB or RS232 + PS2 for power). 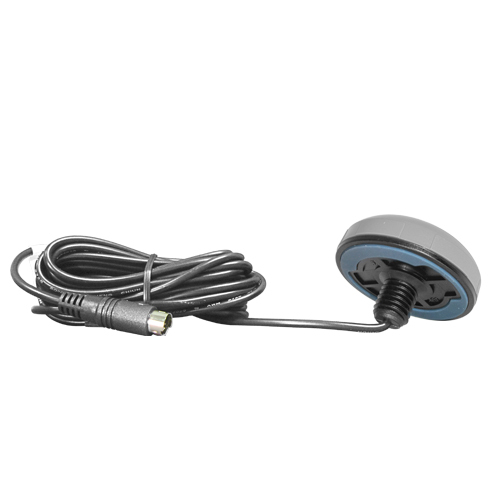 The WAAS/ EGNOS enabled MR-350PS4 is a "mini" external GPS receiver, which utilizes a bulkhead (7/8" through-hole) style mounting design for applications that require a more permanent weatherproof mounting solution. The enclosed GPS receiver is self-contained with an active patch antenna and utilizes the latest "48" channel SiRF Star IV high performance GPS chipset for accurate positioning. It is also IPX7 water resistant rated. The WAAS/ EGNOS enabled by default MR-350PS4 can be used in a wide variety of applications including commercial fleet/utility vehicles, police and fire trucks, boats and specialty equipment, that require great accuracy and durability. For applications that require a only an external GPS antenna without a GPS receiver, please look at our AT-350.